Leading Manufacturer of flexible mould heater and mould heater from Mumbai. 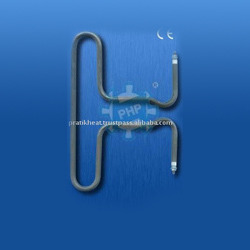 Also known as Formed Tubular Heaters or Flexible heaters, these heaters are mainly used for Hot Runner manifolds. PHP Manifold heaters are designed and manufactured with 40 years of experience, for superior performance and life expectancy to withstand high sheath temperature and provide the best combination of physical strength, high emissivity & good thermal conductivity to heat hot runner manifolds. A superior grade of helical wound high temperature resistant NiCr alloy heating wire is swaged in Chrome Nickel Steel sheathed tubes. The insulation consists of superior grade of magnesium oxide (MgO). Threaded terminal post which gives a cold section of approx 40mm (min) are sealed with special sealing components to prevent the heater from moisture. These are then formed to shapes as required to press fit in the hotrunner manifold which dissipated even heat transfer to the hotrunner mould. For manufacturing manifold tubular heaters it is necessary to provide an accurate dimensional sketch showing all centre distances, bending radius and path. Available in Chrome Nickel Steel. Available in Dia 8mm, 8.5mm, 6.5mm & Square Section 6mm x 6mm. Sealed Edges to prevent from Moisture. Superior Grade Magnesium Oxide Insulation. Swaged for Good Electrical Insulation & Even Heat Transfer. Pratik heat product's, CE certified Mould Heaters for hot runner systems are manufactured with premium materials and under tight manufacturing controls. 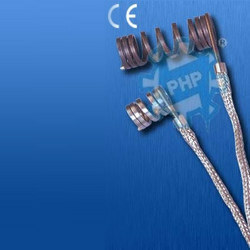 PHP coil heaters, also known as cable heaters or hotrunner heaters, these heaters are an advance concept of thermal engineering which has a construction similar to high watt density cartridge heaters. With 40 Years of practical experience, PHP coil heaters ensure highest quality standards to provide superior performance and better life expectancy at higher temperatures for many diversed applications such as hot runner moulds, manifolds & machine nozzles. Looking for Mould Heaters ?